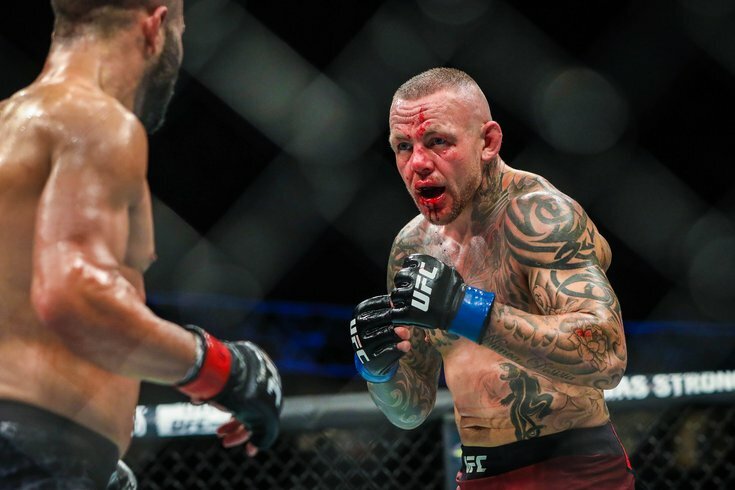 Ross Pearson, who will fight in Philly on March 30, is seen during UFC Fight Night at Scotiabank Saddledome in Calgary, Alberta. In case you missed it, the UFC is returning to Philadelphia for the first time since 2011 this march for a Fight Night card at the Wells Fargo Center on March 30. And while we know the main event — Edson Barboza vs. Justin Gaethje — and a handful of other bouts, the full card has yet to be revealed. However, after reporting two recently-added bouts earlier this month, PhillyVoice has learned of two additional matchups that have been added to the Philly card. First up is a lightweight bout between Ross "The Real Deal" Pearson and Desmond "The Predator" Green. Pearson, a 34-year-old veteran fighter from the United Kingdom, has 15 years of professional experience under his belt. Pearson made his UFC debut nearly a decade ago and is 22-14-0 since turning pro. Green, on the other hand, has only been fighting for UFC since April 2017 and will be looking for his first win in the octagon since that bout (0-3 since). He is 21-8-0 overall as a pro fighter. There's also Sodiq Yusuff vs. Sheymon Moraes in a featherweight bout, which was first reported by PhillyVoice on Tuesday. Yusuff, 25, is fighting for just the second time in a UFC octagon after winning his debut back in December thanks to a first-round knockout of Ashkan Mokhtarian. He's 7-1-0 professionally, and will look to build on that against Moraes, a 28-year-old Brazilian who is 11-2-0 professionally and has won two straight UFC bouts since losing his UFC debut to Zabit Magomedsharipov back in November of 2017.